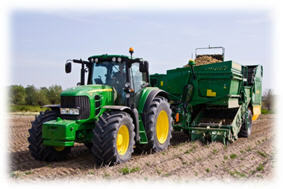 Realize the benefits of AutoTrac on Non-Deere machines. The AutoTrac™ Universal (ATU) 200 steering kit is a mobile guidance solution that brings additional productivity to farming operations throughout the growing season. ATU 200 is approved on over 450 different equipment platforms and is compatible with all levels of StarFire accuracy. With the mobile AutoTrac Universal (ATU) 200 steering kit, producers can leverage their investment in AutoTrac across many approved machine platforms throughout the growing season. This means producers can move their ATU 200 steering system from their planting tractor in the spring, to their sprayer in the summer, then into their combine, and finally to their tillage tractor in the fall. Best of all, the ATU 200 moves from machine to machine in about an hour depending upon the platform. By moving this system, operators can experience the value of automatic guidance year-round. 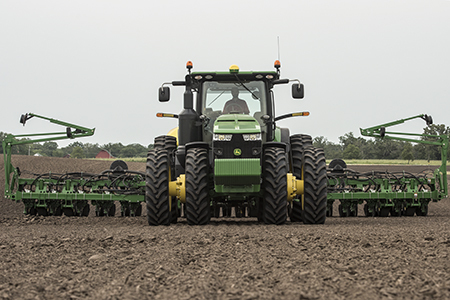 As equipment gets larger and margins tighter, accuracy of in-field operations and input placement is more critical than ever. When making a pass in a field, traveling from one end of the field to another, the position accuracy of the return pass is critical. Pass-to-pass accuracy means the planter guess rows will be accurate and subsequent passes are less likely to result in crop damage. Repeatability defines how accurately the receiver calculates its position over a relatively long time window. Farming requires multiple passes. This requires a method of guidance with a high degree of repeatability in order to minimize overlap (extra cost of seed, fertilizer, chemical and machine hours) and skips (loss of production). Maintaining repeatable accuracy is important in all operations, especially with cropping practices that require multiple passes through the field. AutoTrac creates more consistent row spacing, reducing the potential for crop damage with subsequent passes through the field. University studies have shown that operators tend to overlap 5 to 13 percent over the course of an entire day, which could mean up to 60 cm (23 in.) of overlap with a 6 m (19 ft) tillage implement. This means that a producer with 300 ha (740 acres) actually works and pays for 330 ha (815 acres). With reducing overlap by using AutoTrac more ground is covered in the same time and inputs like chemicals, fertilizer, fuel, labor and machine hours are reduced. AutoTrac™ assisted steering system greatly increases operator productivity by maintaining consistent accuracy and efficiency. Operators remain more alert while they are in the field and are able to focus on implement settings and varying field conditions. 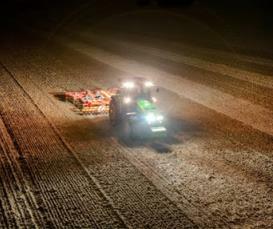 AutoTrac also allows operators to confidently create evenly spaced rows past sunset, as well as in rain, dust, or fog. 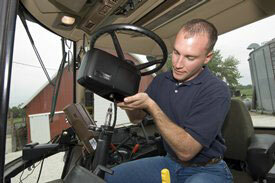 AutoTrac also improves operator comfort as the operator has time to concentrate on implement tasks. As tractors and field equipment become larger and heavier, there is a growing concern about soil compaction. 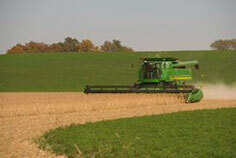 Heavy equipment and tillage implements can cause damage to the soil structure. Soil structure is important because it determines the ability of a soil to hold and conduct water, nutrients, and air necessary for plant root activity. By using AutoTrac, operators can optimize the number of passes and reduce compaction. Additionally, the operator can confine traffic between certain rows and avoid compacting the row area. AutoTrac allows producers to use the same traffic lanes year after year, sacrificing a small portion of the field in favor of having no wheel traffic in the majority of the field. Restricting traffic to specific lanes also provides a firm soil surface for more efficient tractor operation. Without using AutoTrac during field operations, there is tendency for passes to overlap. Each pass over a field under poor conditions can cause significant damage to the soil. AutoTrac™ guidance steering system allows operators to use tramline management more effectively, minimizing soil compaction. Additionally, AutoTrac allows the machine operator to select from a variety of guidance modes including straight track, AB curves, adaptive curves, circle track, boundary fill, machine access, and swap track. These tracking options allow the operator to select the track best suited for the field and conditions reducing the number of passes needed to cover the field. 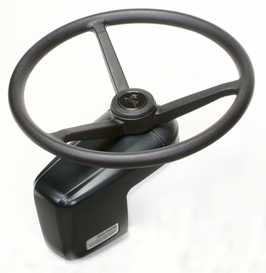 The curve track mode helps operators by automatically steering curved guidance lines on terrain that does not allow for straight track to be used (rolling hills or contours). Straight track is more accurate than curve track. A machine with an integrated AutoTrac steering kit is more accurate than a machine with the AutoTrac Universal (ATU) steering kit. Slower speeds are more accurate than faster speeds. Gentle curves are more accurate than tight turn radius curves. 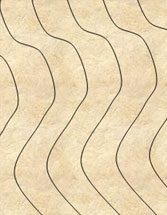 Two different modes can be used depending on the type of curves that need to be created: adaptive curves or A/B curves. This track allows the operator to record a manually driven curved guidance line. Operators using a GreenStar™ 3 (GS3) 2630 Display have the ability to record and utilize multiple adaptive curves per field. This feature is especially useful as operators maneuver around terraces or irregular, constantly changing fields. Adaptive curve mode also has the ability to connect line segments when documentation is selected as the recording source. Self-propelled forage harvester or combine operators may find this functionality useful if they need to quickly raise their header for any reason. This track allows the operator to set a curved line in a field with two end points (A and B) and will generate guidance lines parallel to the initial track in either direction. The line stays the same across the field, and an operator can use skip track. Even if an operator drives around an obstacle in the field, the next pass follows the original track line. The straight track mode helps operators by automatically driving straight. Operators can create an initial straight line using a variety of different setup options. Once the track has been defined, all subsequent track lines in the field are created parallel to each other at the defined track spacing distance. 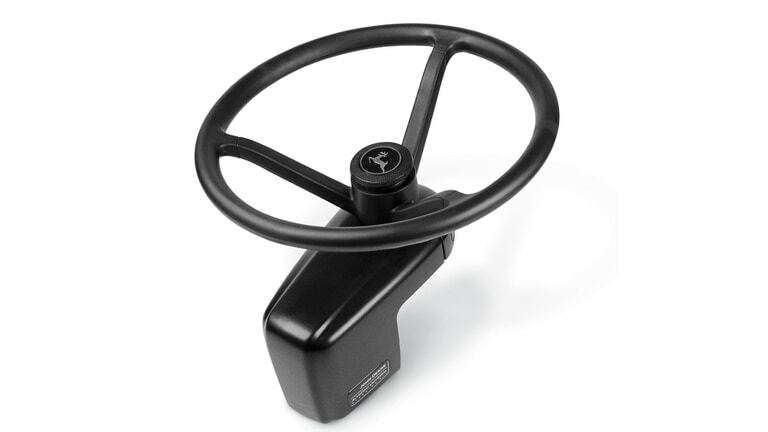 The circle track mode helps operators drive concentric circles in a field when a circle is set up and guidance is being used. Operators can create an initial circle using a variety of different methods. Once the initial circle has been defined, all the subsequent circles in the field are created. Circle track is available in Parallel Tracking mode. Pivot Pro activation must be purchased to use circle track with automatic guidance. The Pivot Pro module allows the operator to automatically guide a machine in defined concentric circles in fields with center-pivot irrigation systems. Circle track functionality is included with GreenStar Basics, allowing the operator to manually guide the machine around the concentric circle without an upgrade activation. 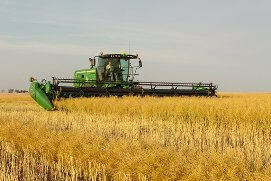 Pair Pivot Pro activation with GreenStar AutoTrac to have the machine drive circles automatically. Pivot Pro is approved for level fields, as accuracy can be degraded as slope increases. If there is slope in the field, there is the potential the circle track space and the center-pivot tower track will not match up. Keep in mind, AutoTrac draws the circle spacing as if the plane were level. 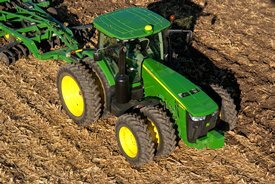 Unique to John Deere Active Implement Guidance, the follow track mode assists the driver when operating headlands or navigating around obstacles, allowing the implement to follow the tractor guidance path. This helps reduce crop damage and soil compaction. 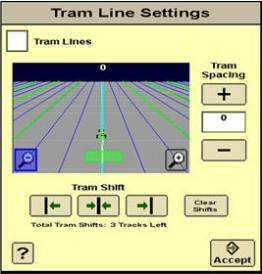 Tramline management provides the opportunity to setup and edit certain guidance lines as tramlines. Those lines will be highlighted in a separate color in the guidance screen. Tramline management is available on the GS3 2630 Display in straight track, AB curve, and circle track modes. Tramlines can be set and stored for each A-B line in the display. 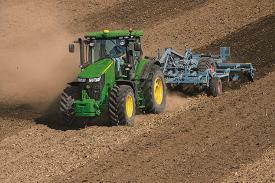 This allows the operator to properly seed and plant fields with accurate tramlines defined. 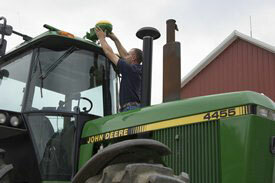 This will make it easier to reduce inputs on all following field operations such as spraying. NOTE: Tramline management is not currently available on the GS3 CommandCenter™ controls. Swap track provides operators the ability to quickly switch guidance modes as they work through fields varying geographic conditions. Operators can easily move from straight track to any of the other tracking modes as needed. Swap track allows the operator to toggle between up to four different guidance lines within the same field on the GS3 2630 Display. Operators can also change the track order while AutoTrac is engaged. Swap track is available on the GS3 2630 Display. NOTE: Swap track is not available on the GS3 CommandCenter.